MarketingSherpa is a publisher focused on reporting on inspirational stories of customer-first marketing. Our goal — to give marketers of the world the stats, inspiration and instructions to improve their results. Since 1999, we’ve published 8,508 (and counting) case studies, how-tos, charts, blog posts, videos, publications, events and webinars, which can be searched in the MarketingSherpa library. Our name "Sherpa" refers admiringly to the Sherpas of Nepal who guide climbers up Mount Everest. Our goal is to be your friendly native guides who help you on your tough climb toward more effective customer-first marketing results. Our offices are located in Jacksonville, Florida, at MECLABS Institute. MarketingSherpa is a subsidiary of MECLABS, a research organization dedicated to discovering how people make choices. 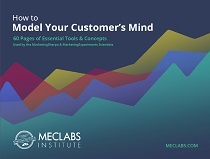 MECLABS provides research, education and services backed by customer-first science.